Do you by any chance remember a children's program from the early 1990's called 'Under The Umbrella Tree?' It was one of my favorite childhood shows, even though I never knew that an umbrella tree was actually a real plant. Fast forward to the present day, I actually happened upon one at my local grocery store. It was fate! I just had to have it. Its actual plant name is Schefflera. It came in a teeny-tiny 4-inch pot. 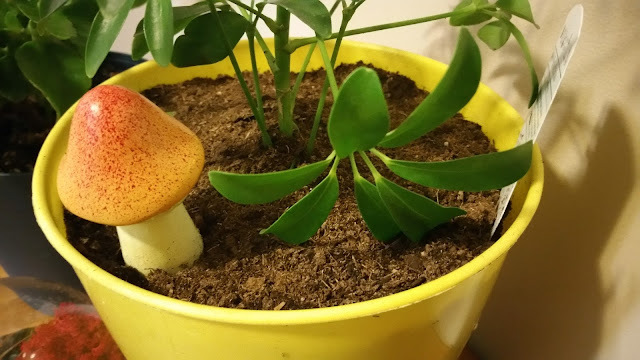 I left it in its pot for about 6-months. Eventually, the roots began to creep out of the pot. 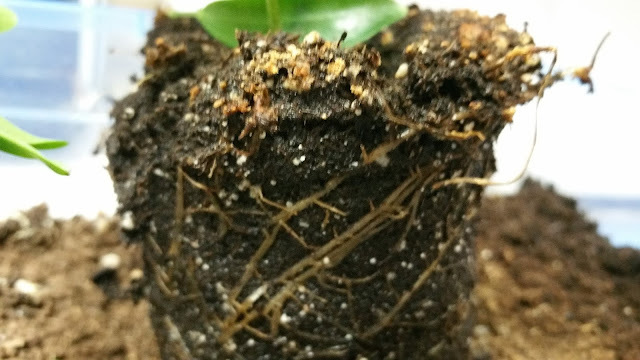 Roots creeping out over the top of where the pot was. Place a few stones over the drainage holes of your new pot. 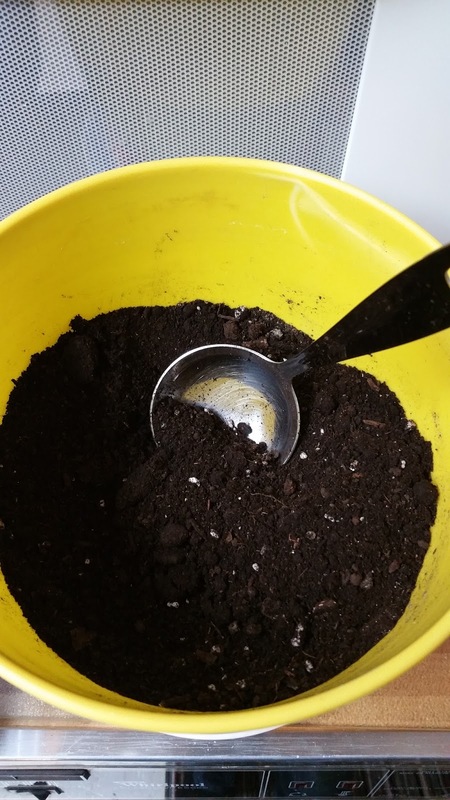 Add fresh soil to your new pot until it is about half-way full. Remove the plant from its old pot by gently squeezing the sides of the pot until it becomes loose. Gently slide the pot off of the roots and soil. Center the plant in its new pot. Using a spoon, gently ladle fresh soil all around the plant. 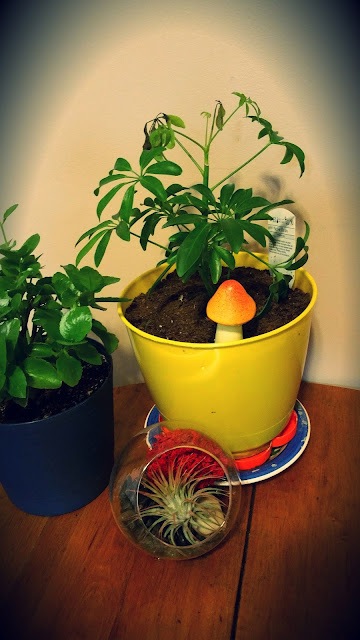 Firm the soil gently around the schefflera to stabilize it. Water your freshly repotted plant thoroughly and place in an area where it receives indirect light and is away from drafts and heating vents. Water whenever the soil feels dry to the touch. And that's pretty much it in regards to repotting. I will poke a fertilizer spike into the schefflera's soil in a few months time, though. Back hanging out with his plant friends! 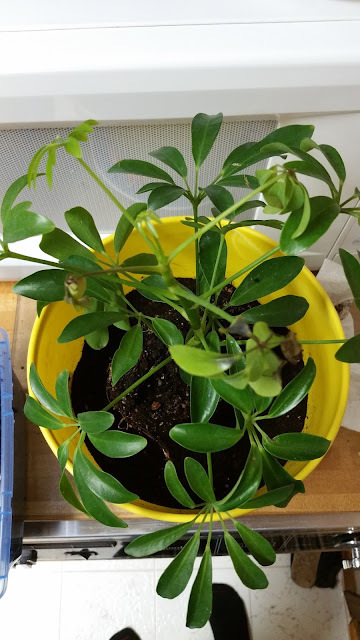 How did you make out repotting your schefflera? Let me know in the comments section below, I would love to hear from you. If you enjoyed this tutorial, please 'LIKE' Keen Koala on Facebook for instant access to the latest posts, exclusive content, and contests by clicking HERE!